Asia Week New York 2015 is a non-stop week of Asian art exhibitions, auctions, and events throughout the New York metropolitan area from March 13–21. 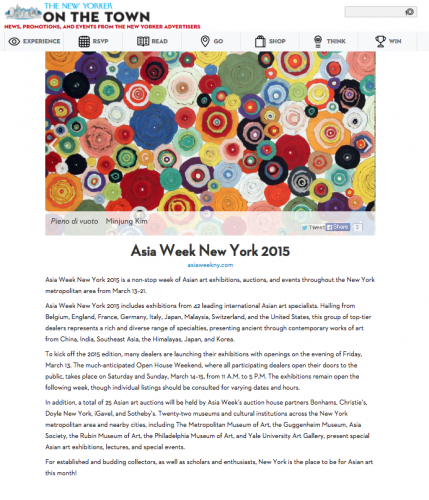 Asia Week New York 2015 includes exhibitions from 42 leading international Asian art specialists. Hailing from Belgium, England, France, Germany, Italy, Japan, Malaysia, Switzerland, and the United States, this group of top-tier dealers represents a rich and diverse range of specialties, presenting ancient through contemporary works of art from China, India, Southeast Asia, the Himalayas, Japan, and Korea. To kick off the 2015 edition, many dealers are launching their exhibitions with openings on the evening of Friday, March 13. The much-anticipated Open House Weekend, where all participating dealers open their doors to the public, takes place on Saturday and Sunday, March 14–15, from 11 A.M. to 5 P.M. The exhibitions remain open the following week, though individual listings should be consulted for varying dates and hours. In addition, a total of 25 Asian art auctions will be held by Asia Week’s auction house partners Bonhams, Christie’s, Doyle New York, iGavel, and Sotheby’s. Twenty-two museums and cultural institutions across the New York metropolitan area and nearby cities, including The Metropolitan Museum of Art, the Guggenheim Museum, Asia Society, the Rubin Museum of Art, the Philadelphia Museum of Art, and Yale University Art Gallery, present special Asian art exhibitions, lectures, and special events. For established and budding collectors, as well as scholars and enthusiasts, New York is the place to be for Asian art this month!